Happy Independence Day! 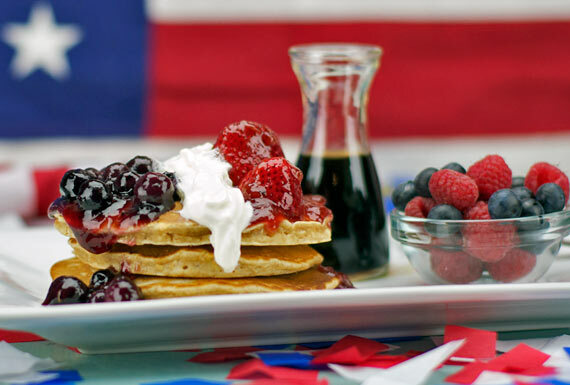 Today’s ideas are all about adding some red, white and blue flare to your morning meal. 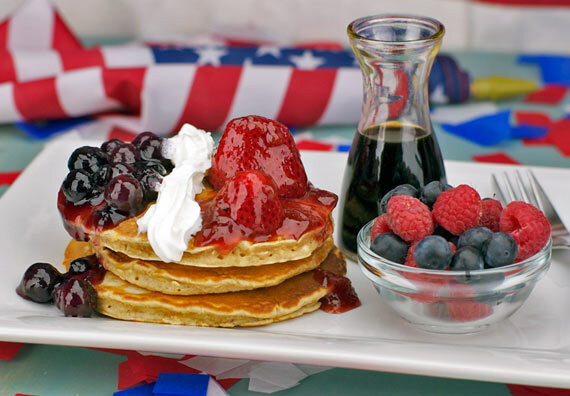 If you have some berries and bananas, you have the power to transform an ordinary breakfast into an All-American Fourth of July Spectacular Breakfast. 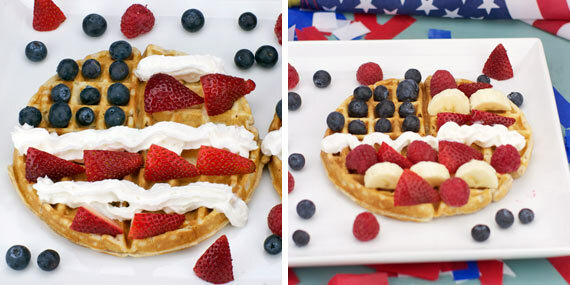 Add some whipped cream or yogurt and the patriotic possibilities are endless. 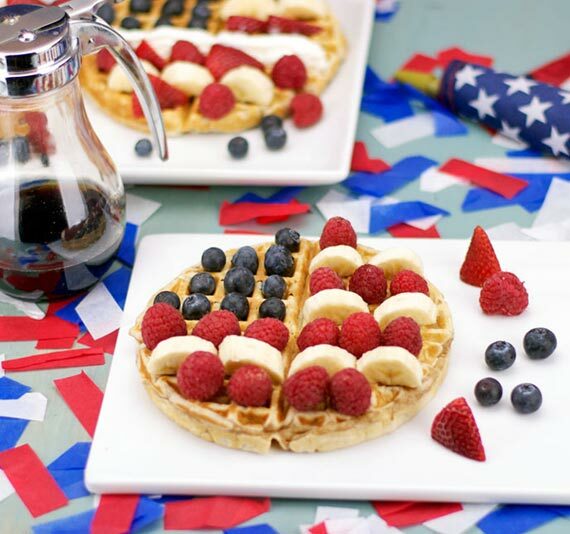 The easiest (and maybe most fun) thing you can do is arrange berries to make an American flag pattern on waffles, pancakes or French toast. Here, you can see combinations of blueberries, strawberries, raspberries, banana slices and whipped cream. Those are Apple Cinnamon Waffles in the pictures. The warm apple pieces in the waffles tasted amazing with the fresh berries on top. For standard waffles, I’d recommend the following recipes: Best Waffles Ever (quick waffles without yeast) or Overnight Waffle Batter (yeast waffles from a batter that needs to rest at least 7 hours). In a matter of seconds, you can turn ordinary toast into USA-mazing toast. A spread of cream cheese gives you a white canvas to work with. Strawberry jam is used to make the red stripes of the flag which are offset by banana pieces to make the white stripes. I especially love this idea because it’s so kid-friendly. Wee ones will have a blast making a flag out of a piece of toast. 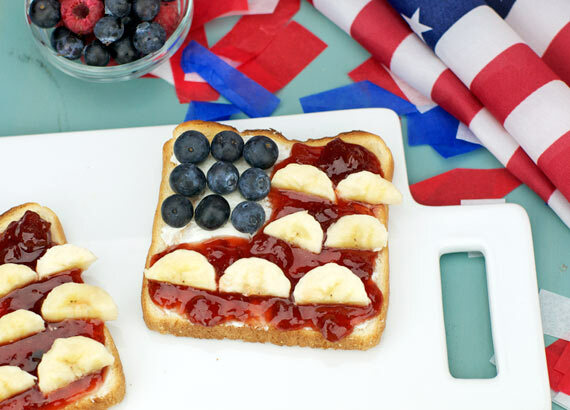 You don’t really need a recipe for this, but here’s one anyway: American Flag Fruit Toast. 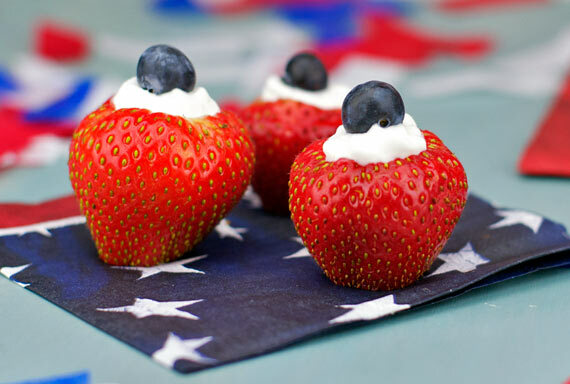 A super cute way to add Yankee Doodle yumminess to breakfast is to make Fourth of July Berry Bites. These are just large strawberries with the stems removed and the bottoms sliced so they’ll stand upright. Fill the hole where the stem was with whipped cream and top with a blueberry. This idea is awesome because you can use it as a garnish with eggs and omelets and still get some red, white and blue on the plate. 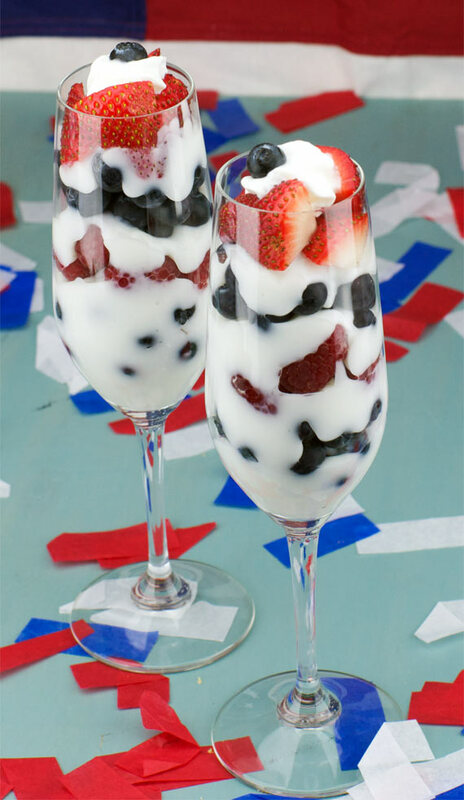 A parfait is a great way to add patriotism and nutrition to your breakfast. In the picture above, you see Fourth Of July Breakfast Parfaits made with vanilla yogurt, blueberries, raspberries and strawberries. You can easily adjust this recipe to include bananas, cherries, whipped cream or any other ingredients that match the colors of the holiday. For a bigger twist, try using oatmeal in place of the yogurt. Now that we’ve conquered using fruit in its God-given form, we can graduate to fruit compotes as seen in the Red, White & Blueberry Pancakes above. On the Fourth of July, I’m all about making a beautiful breakfast quickly so I can go out and enjoy the day. So, I’ll use jam, water and berries to make compotes in half the time as other compote recipes. You simply cook down about 1/3 cup of jam with a couple of Tablespoons of water until it’s thin and fluid. Stir in berries and turn off the heat. In few minutes, it’ll start to thicken again and, just like that, you have a fruit topping. The toppings in the recipe above can also be used on French toast and waffles. You can also swirl the compotes into oatmeal for Oat-rageously American Hot Cereal. 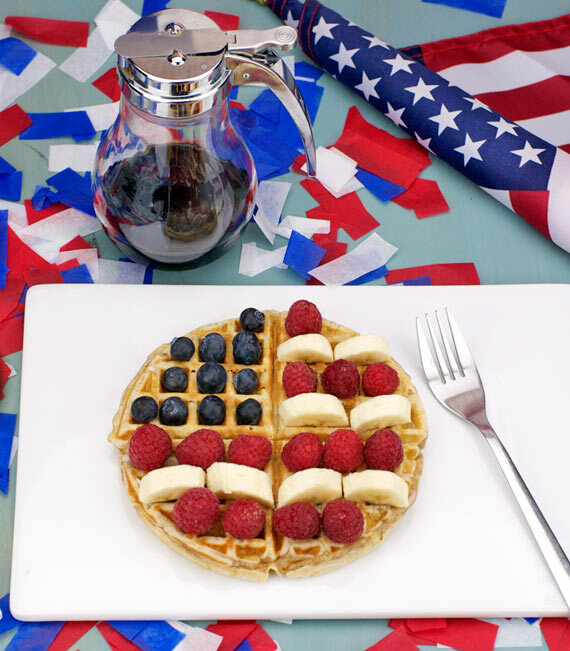 With liberty and breakfast for all… I wish you a very happy Fourth of July! This Oatmeal Tastes Like Banana Cream Pie! Thanks for the nice comment and the mention in your blog! Happy early 4th of July! Hello, Mr Breakfast! I was wondering, why did you stop making YouTube videos? Had a kid. Hoping to make some more soon. Stay tuned. Thanks for your interest!